I have several partition in my system and I need one of them, that I use always, mounted automatically at boot. Is there a simple way to do this in OMLx 4? Add it to fstab … ? 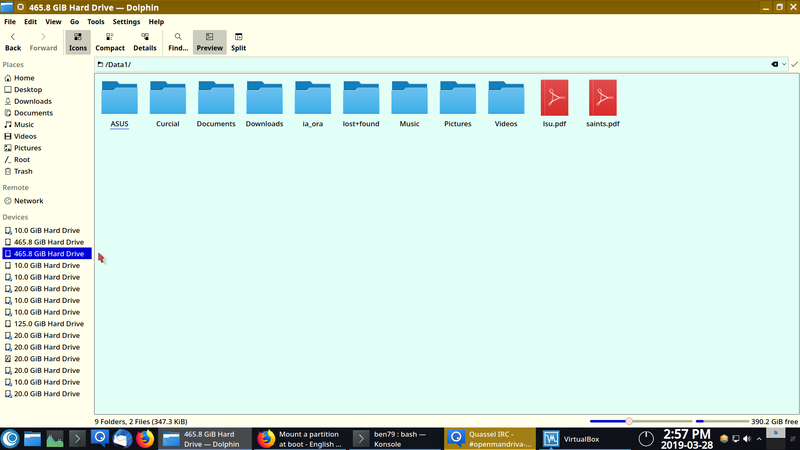 A simple way if possible, better if using GUI. 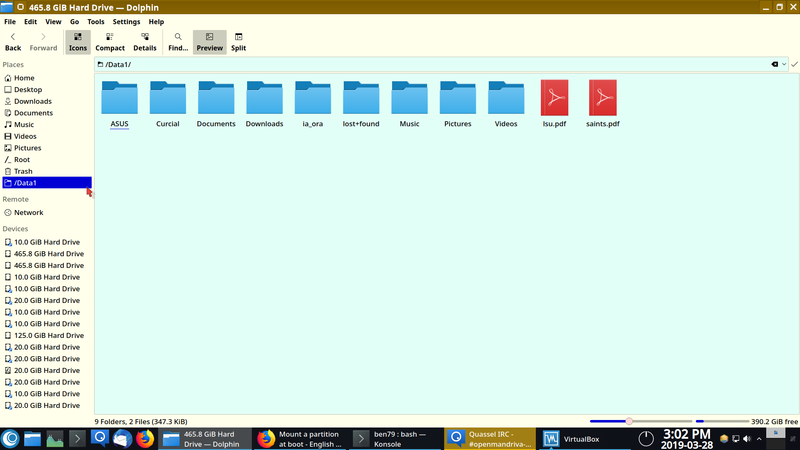 If you need GUI tools for it… then you can choose any partitions manager like gparted, gnome-disk-utility or even better kde partition manager. So in “Manual Partitioning” you do whatever else you want to do to install your system. 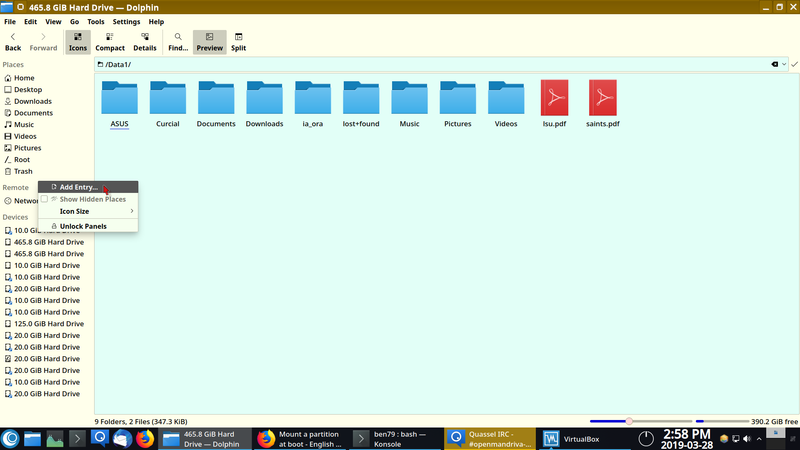 Then for the partition/partitions you wish to mount you select the partition, select ‘Edit’, select ‘Mount point’ and in the drop down list select /var (or /usr, /srv, /opt) and change it to what you want. In my case I change it from /var to /Data or /Data1 (you can call it anything you wish). And do not format this partition. If you format all data will be removed. That’s it. Now the installer will automatically add an entry to your ‘/etc/fstab’ file and the partition will be automatically available at boot. If you have already installed your system and need to do this it is still very easy to do and is described in this “How To”. Now for a hot tip. After you have added your extra partition when you boot into you newly installed system you can add an entry for it in Dolphin. 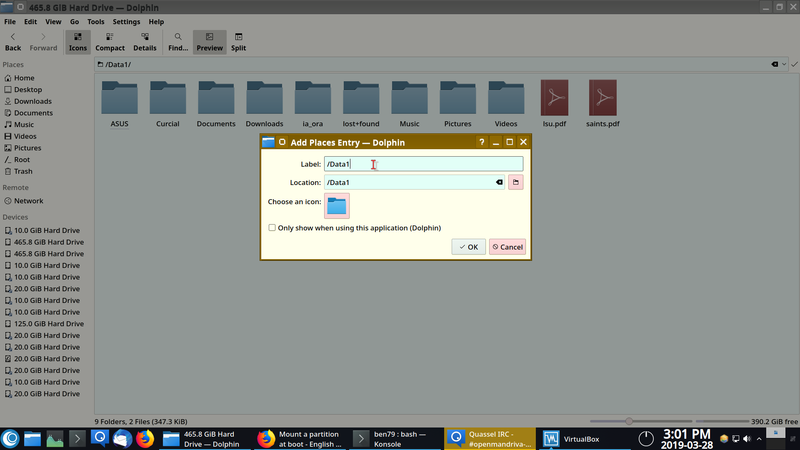 Select ‘Add entry’ and your previously selected partition should be listed in the ‘Location’ line. Simply copy and paste that to the ‘Label’ line and select OK.
Now you have a convenient entry added in Dolphin for your Data or whatever partition. Thanks for hint I’ll use to add a folder I use everyday at work. Very useful your guide to mount a partition but I add one o two more steps. Finally not so clear how to choose the mount point if I want partition available to all users. Huh? Don’t understand. Mounts points in /etc/fstab are system wide and not specific to user. If it’s on the system it is on the system for all users.